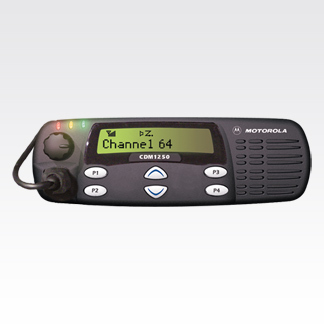 The CDM1250 mobile radio is no longer manufactured, however accessories and replacement parts may be available. Please contact your Motorola representative for additional information. Perfect for growing organizations, the flexible CDM1250 mobile two-way radio can readily expand to meet rapidly changing business needs. Enhanced audio and a powerful front-projecting speaker ensure superb sound clarity, even in noisy environments. The display's user-friendly icons make information easy to understand. A full range of signaling capabilities includes such features as Caller ID and customizable call lists. Operates on choice of 64 channels. 14-character display uses icons and text provide clear indication. Migrates easily between 25-kHz and 12.5-kHz frequencies. Four buttons allow users to add favorite features. Sends information via digital signals. Remotely deactivates a lost or stolen radio. Continually monitors channels for activity. Faces front rather than on top for maximum clarity. Sends and receives through features such as Push-to-Talk ID, Selective Call and Call Alert. Displays signal status, for better monitoring of communication. Dimensions (H x W x D): 2.34 x 7.05 x 7.8 in.